I just wanted to share this in case anyone is having the same issues as me. PROBLEM 1: Main page remains static – doesn’t update the top page with the books you are currently reading. SOLUTION: Update your date and time! Yes I had this too. And for ages I thought, well it doesn’t matter I can just find the book in my library. Turns out all it needed was for me to update the date and time! I had previously reset my Kobo and because I never use it to check the time so it never occured to me. But when I checked it was set to something ridiculous like 1890. Main Menu > Settings > Date and Time > change > SORTED! PROBLEM 2: You just tried to connect your Kobo to your PC/Mac/other device and it hasn’t been recognised. SOLUTION: Try a newer USB cable! Yes I had this problem too. And again I thought, perhaps my Kobo is just too old to handle this… it doesn’t matter, there are still loads of books on my Kobo. But then It connected first time when I used a newer cable. I personally used the one for charging my bluetooth headphones, but I would try any newer cable that’s micro USB to USB. PROBLEM 3: You just tried to add a bunch of ebooks and they just don’t show up. And yes, of course you tried more than once. SOLUTION: Try the tips below! Yes I had this problem too. And you know the drill… I think I tried about 5 or 6 times before I started trying different ways. It turns out there are a few work arounds you can use to get your ebooks across. These are the things that work for me. *Tip 1: If you find your books aren’t transferring, try using Calibre. *Tip 2: Check your file size. If your books are more than 10mb each try adding them separately. I would try to add batches that are no more than 15mb total. *Tip 3: REMEMBER TO EJECT YOUR KOBO! And don’t eject your Kobo straight after the transfer, give it time to process. If my book is more than 15mb I tend to transfer the book, go away and make a cup of tea, come back, and then eject the Kobo. *Tip 4: Don’t unplug your cable straight away. Wait in case your Kobo is still processing. Even a few minutes can help with large files. *Tip 5: After the transfer just leave your Kobo to do its thing. Don’t try to use it straight after transfering. And don’t worry if it seems to be unresponsive at first – it’s usually still updating the library. The updating can take ages to start and ages to process. Just leave it and go make a sandwich or watch some youtube videos. *Tip 6: Try smaller batches. It’s possible that one of your ebooks is corrupt or badly formatted causing the whole transfer to fail. Try just transferring 5 books at a time (as in transfer ebooks, eject, unplug, wait for system update, check books have successfully transferred) or make sure you don’t transfer more than 15mb at once. The fewer books you do at a time the easier it is to pinpoint that problem ebook. But my Kobo was another story. It has never crashed before and I felt a bit at a loss. But then practical thinking kicked in and I actually managed to fix it in less than 10 minutes. My solution is at the bottom of the page, but one of these other less violent methods may work for you. I tried these things first, as recommended by many users. This will just reboot the device. 1.) Turn off (if you can). 2.) Locate the tiny reset button which is either at the top near the power button or on the bottom of your Kobo. 3.) Use a piece of wire or a paperclip or a mechanical pencil and press the button down until you feel it click. 4.) Your Kobo should restart. This wipes your device and restores it to the Factory settings. 2.) Slide the Power button and press the Home button at the same time. The Power light should start flashing blue. 3.) Keep holding both buttons until you see your device screen restarting itself. Sometimes this can jump start the device, shocking it into responding. Just connect using your cable and see if anything changes. Sometimes all your device needs is a good kick up the backside. 1.) Connect your Kobo cable to your laptop (PC, Mac, whatever computer you have available) but not to your device. 2.) 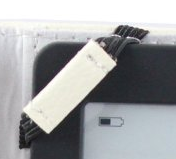 Get a good grip on your device and push the cable connector into the Kobo with a certain amount of force (but obviously not so much it damages the device). 3.) Hold the cable connector and continue to apply pressure (but again not so much it damages the device). My device responded after about 10 seconds and went to the usual “do you wish to connect to this computer” screen. After I ejected my Kobo and disconnected from my Mac, the screen locked for a few minutes and went completely blank. However, I slid the power button to turn it off and then turned it back on again and it was fine. It seems OK now. Turns on and off, sleeps, all my books are still there and responding, my home button works… A very strange glich. Recently I was actually given a Kobo Touch to fix that failed with all of the above. However I managed to jump start it by using my solution above but connected to a mains socket rather than a computer. I would only recommend this method if all other options have failed as it could potentially kill your device completely. I used the usb plug adapter that came with my iPhone and a surge protected plugboard. The device took much longer to respond (maybe up to 40 seconds of pressure) and a few attempts (although this may just be that I did not try for long enough at first). But yes, if you are willing to take the chance give it a whirl. The owner said all her books were still there and it has been working fine ever since, so could be worth it. I mentioned previously that you can write notes and play Sudoku on a Kobo Touch. And a request came up about how exactly you find the Sudoku and other extras. 1.) Press the Home tab and from there choose Settings. 2.) At the bottom of the Settings Menu choose Extras. – you can use this to write quick handwritten notes with your finger. When using the Sudoku you have four different levels of difficulty to choose from: SIMPLE, EASY, MEDIUM and HARD. To change the difficulty simply click the third (lowest) button on the bottom right of your Sudoku game screen. This is also the button you use to quit in the middle of a game, although I usually just use the HOME button.